Responsible for directing, coordinating, and supervising all greens, tees, fairways, irrigation systems, drainage, bunkers and planting. Preparations and applications of chemicals and fertilizers as needed. Inspects turf for damage, disease, etc., and recommends proper corrective action. Supervises operation and maintenance of equipment. Establishes and implements work procedures to insure grounds are properly maintained. Supervises all golf course personnel. Daily inspection of course for improvements and changes needed. Development of regulations and policies; coordinates with clubhouse staff on golf course and tournaments. Bachelor’s degree in golf course management, turf grass maintenance, or closely related field and minimum of 4 years’ experience in golf course grounds maintenance and 4 years’ supervisory experience in golf course management. Possession of pesticide applicator license training. Other requirements include excellent communication, organizational skills. Full Time, with 10 vacation days initially as a full time employee, which I prefer to be taken off season. The company provides health insurance, and covers 50% of monthly premiums. 401k plans are available after 6 month of employment, as well as dental, vision and life insurance. You are able to “opt out” of medical coverage, if you have alternative coverage through a spouse. You report directly to the General Manager. Nate McKinniss, OSU Turf Club Treasurer. Nate is a past recipient of multiple industry scholarships including the OTF R.D. Baker Scholarship. He will also be traveling overseas as the 2016 TurfNet intern. 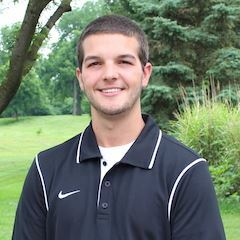 My name is Nate McKinniss, turfgrass student and Turf Club Treasurer at the Ohio State University. On behalf of the Turf Club at OSU, I would like to ask for your support of our annual golf outing which will take place on Sunday, April 17th in Groveport, Ohio. This event is our club's biggest fundraiser of the year, and we hope to engage OSU alumni and program supporters from around the state. OSU Turf Club hosts this golf outing for the purpose of raising money for the turfgrass students who travel and participate in the Golf Industry Show and Sports Turf Managers Show Turf Bowl competitions. Most travel expenses are out of pocket for us students, in which case not many of us go. We are hoping to give more students the opportunity to experience these annual conferences and Turf Bowls as they are excellent learning experiences. To allow more students to attend, we need a big turnout for the outing. Information about the golf outing is included within this note (click here). 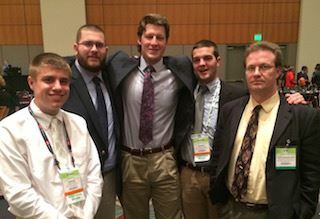 (Left to right) Steven Shavel, Tanner Turner, Michael Sanders, Nate McKinniss and David Gardner at this year's Golf Industry Show. The team placed 12th out of nearly 80 teams at the GIS Turf Bowl and 8th out of 25 teams at the STMA Turf Bowl. With that, we want to pull in enough teams to fill up the course. It would mean a lot for us to be able to network with alumni while raising money for the club! As you know, Ohio State alumni and program supporters are located all over the world! These annual conferences are our opportunity to interact with these individuals, talk about the current program and in many cases, line up future employment. Even if you are not able to play, please consider supporting the club by purchasing a hole sign, donating a raffle item or simply making a small contribution to the club. With your support, we can send even more students to these events and show the country just how strong Buckeye Nation truly is!